Susana Arenas’ Cuban dance students and members of Raices Profundas Dance Company. I’m on the far left. 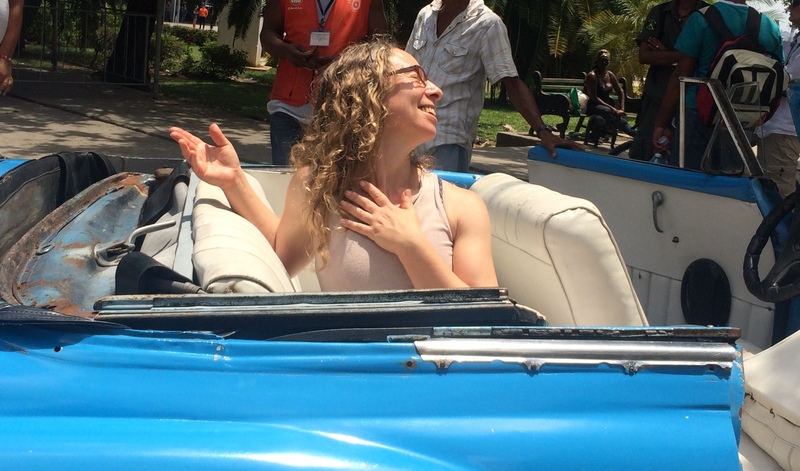 We wondered what it would be like to be disabled in Cuba. This man on crutches seems unusually unhindered, but I imagine he is the exception not the rule. 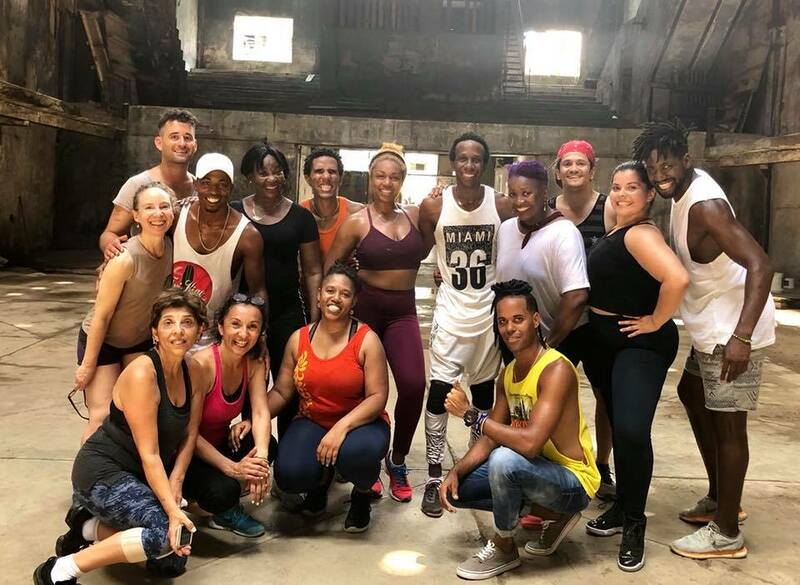 In August, I travelled to Cuba with Susana Arenas to study dance with the world acclaimed Afro-Cuban folkloric company Raices Profundas (Deep Roots). I was amazed by the vitality and beauty of the Cuban people walking on the streets of Havana. (The photo at the top of this page is a casual snap of everyday people). Cubans carry their heads high over their hips. Their chests are open, and arms swing free. An observer can draw an invisible vertical line from head to standing heel. This results in a vibrant upright posture and a flowing gait. 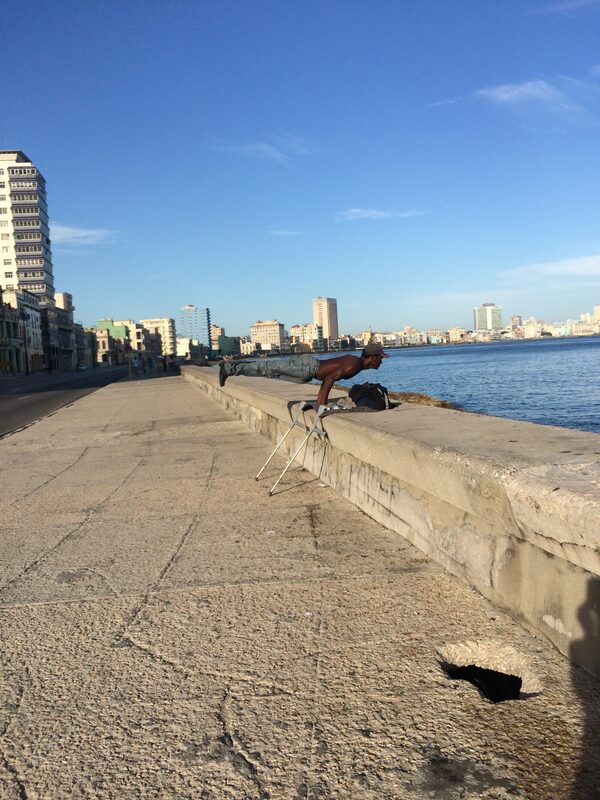 While you would expect this in youths, even elderly Cubans sped down the pitted streets with long spines and supple hips. You don’t see this in the US. Typically, as we age (and even these days in people quite young), our legs stiffen, our stride shortens, and forward motion degrades into side-to-side sway. Walking slows and is often uncomfortable. While there is no homelessness in Cuba, there is also no money to maintain the gorgeous Beaux Arts and Art Deco architecture. 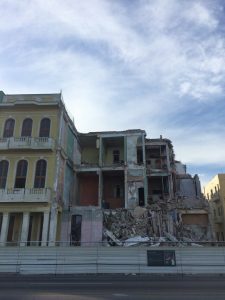 The number of collapsed buildings in Havana makes the city looks like a war zone. True, there is terrible poverty in Cuba. In Havana, a building falls down every 3.1 days. The sidewalks are crumbling and gape with treacherous holes. More conservative friends reminded me that Cuba is still under the rule of a repressive regime. I didn’t see much of this, but a wikipedia search reminded me of some hard facts about human rights and the Cuban state. Still, the Cubans were notably more relaxed than Americans and perhaps this partially explains their upright stance. I admit, I was enchanted by the concept of a country with no homelessness, universal healthcare, and free education. Gun violence is unheard of and murder rates are low. I felt safe on the streets at night. The people did not seem beaten down by the fear, stress and depression that I see everywhere here. Of course, you can’t understand a culture in just a few days. My impressions are only that. This dramatic space (to the left) is the professional rehearsal hall for Raices Profundas. Having grown up with the idea that dance classes take place in clean rooms with sprung wood floors and gleaming mirrors, this studio – a once-upon-a-time movie palace, with cement floors, a pocky corrugated tin roof that let both shafts of sunlight and rain in – required a recalibration of expectations. I was surprised that by the third day it felt like a refuge. It felt like home. I remember reading in the Talent Code that impoverished athletic facilities are correlated with enhanced performance. Perhaps necessity is the mother of invention, or perhaps soul and heart are not located in the places that we think. The US Embargo stopped car imports to Cuba, making Havana a living museum for classic American cars. 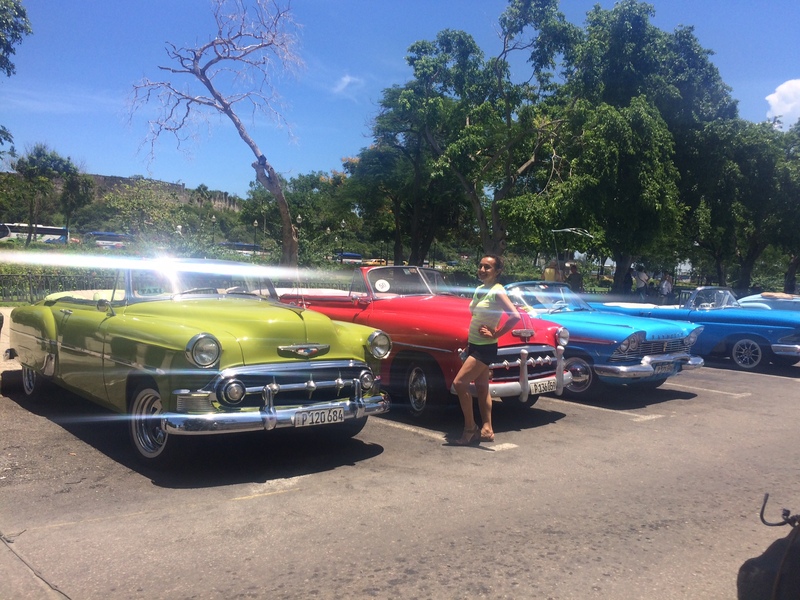 Cuba is said to be in time warp since the revolution in 1953 when imports from the US stopped. Perhaps the downfall of bodies was also slowed. Although Cubans have smart phones, wifi is uncommon and people do not walk the street with their heads down and eyes glued to screens. But even in the US just 10 years ago, before the advent of smart phones, I don’t remember that we ever displayed the type of natural upright flow that you see in Cuba. Why do Cubans have such poise? My best guess is that it’s the music and dancing that is so prominent in life. The undulation of the hips in salsa is a close approximation of the pendular movement of the pelvis required for an efficient walking gait. Music and social dance optimize coordination, cognition and group cohesion, entraining people into what psychologist Daniel J. Siegel describes as the “neurobiology of we,” an essential component of secure attachment and stress resilience. Perhaps this gives Cubans the body intelligence and the emotional grit to stand tall in the face of hardship. But no one thinks about it like that. 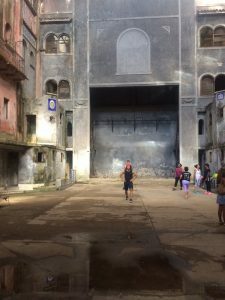 “I’m Cuban, therefore I dance!” said our tour leader, a woman in her 60’s, as she stepped out onto the dance floor executing complex figures with fluid panache. 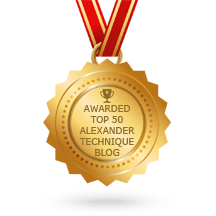 Find out if the Alexander Technique can help you. Let’s bring some poise back to our people.